jom had the most liked content! I stripped down my check control unit to fix the pixel display, and removed the display frame at the same time by desoldering the 3 tags that connect to the main PCB. (These tags are for the backlights on the display). Now I've re-assembled it the lights don't work... I've resoldered, checked the lights are actually working (12V across the tags) but no backlights when its powered by the in car connector. Any ideas? PS have got most pixels working, but I didnt realise that the film connector is supposed to be soldered to the board - mine isn't! A repair kit, including the special soldering iron bit and silicon strip, is on it's way from Aliexpress. Got sick of the slow return on my E36 coupe driver's seatbelt. Tried to find a replacement - it's BMW supplied only: so I googled a fix. Simple - wash the seatbelt in laundry detergent (in a bucket on the seat) and let dry. It removes all the accumulated human remains that prevent the belt from flexing (Yuck!) It nearly worked, so I went further and removed the rear trim panel, cleaned the guide bar for the the belt (also yucky). Then after re-gluing the trim attachment to the side panel (It's only 22 year old glue, really! ), re-gluing the vinyl around the inside of the belt aperture (all to make the gap in the trim bigger) it WORKED. I now have a belt that retracts at the speed of a frightened rabbit. Mike Page in Paraparaumu. Porirua European moved out of Porirua some time ago. 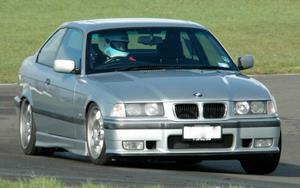 Point of order, chaps, the E36 rear discs also have internal drums for the handbrake emergency braking system. heaps of fun for 15k! In those days the cloud was a magic device that stuff went into, a miracle occurred, and it came out different!